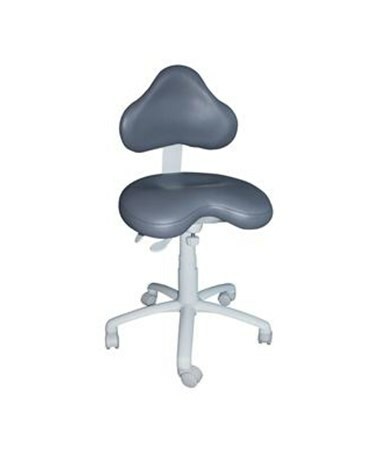 Brewer's 9200 Series Dental Stool combines features from Brewer's 9000 and 9100 series stools for seating with a deeper seat and a smaller, sleeker backrest. On top of this clever seat and backrest combination, the 9200 series can be customized with seamless upholstery, an adjustable foot ring and/or left or right contoured, ratcheted body support, as well as being available in five different height ranges, for an ergonomic seating system that is both comfortable and highly functional. 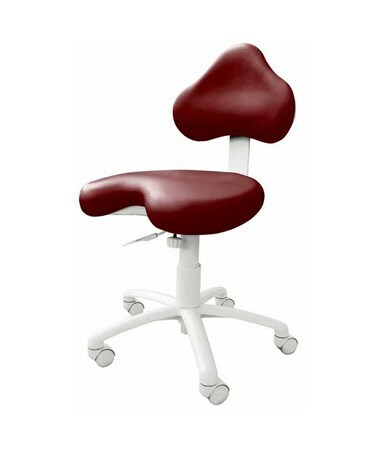 The deeper, contoured 18" x 18" saddle-style seat carries with it a host of beneficial features. Featuring HybriGel layered, high density foam, the seat is designed to take pressure off of your lower back and thigh region. Its unique waterfall edges are under laid with polyurethane, which increases flexibility while eliminating pinching. The synchronized movement of the seat and the backrest results in proper weight distribution as well as neutral posture while performing day-to-day activities, promoting muscular health. Lumbar support is provided by the 18" x 12" cut-out backrest, accomodating side-to-side reaching without sacrificing that support. The backrest is ratcheted for easy height adjustment. Pneumatic height adjustment of either 15.5" - 20", 18.5" - 24.5", 20.5" - 26.5", 22" - 31" or 24" - 32" makes it easy to find the most comfortable seating position. A 21.5" powder-coated cast aluminum base equipped with polyurethane tread casters provides stability and smooth, reliable movement. The stool has a weight capacity of 250 lbs. All Brewer products conform to US and Canadian electrical and medical industry codes and regulations, and come with a 5-year warranty. The 9200 series has several options to choose from when ordering. The adjustable foot ring allows you to place your feet where you'd like, taking the strain off your lower legs and thighs. Contoured, ratcheted and fully adjustable body support (made with HybriGel foam) comes in left or right side versions and provides valuable resting areas. Finally, the upholstery is available in a large variety of colors and can be enhanced with the seamless upholstery option. 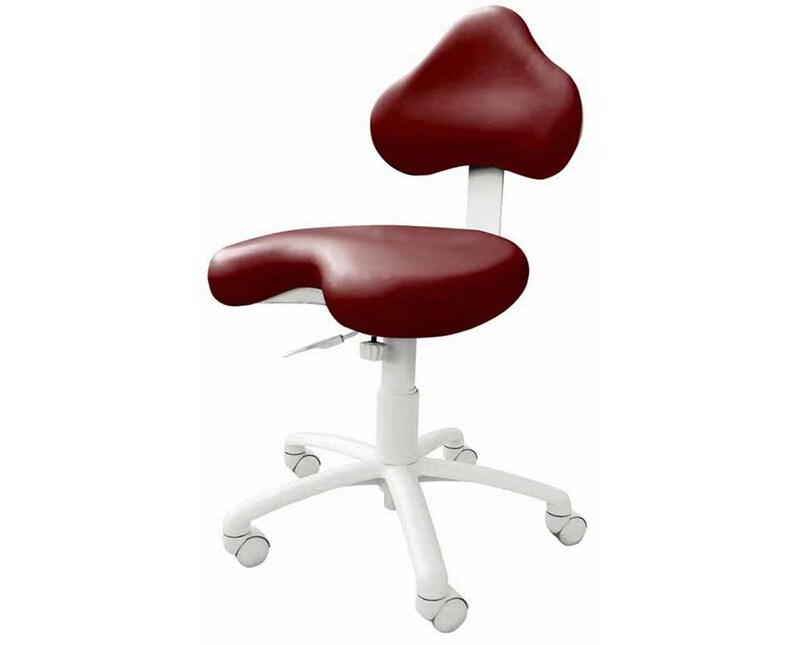 We offer Brewer's 9200 Series Dental Stool with five different height ranges and three customizable options: seamless upholstery, adjustable foot ring and left or right body support. The upholstery comes in a wide range of colors - view the color chart and specify the color you would like in the "Special Note" section during checkout. Select from the other options available in the drop down menu above and order online direct by clicking "add to cart!" Seat Height Range 15.5" - 20", 18.5" - 24.5", 20.5" - 26.5", 22" - 31", or 24" - 32"